When you're working 9-5 (or for a bootstrapped start-up with even more hours), finding time outside of work to give back to the community can seem almost impossible. That's not the case for Taylor Copeland. Not only does Taylor currently work at Google, but she's growing her family, owns a real-estate business AND a non-profit, 'Beyond the Basics Inc.'. 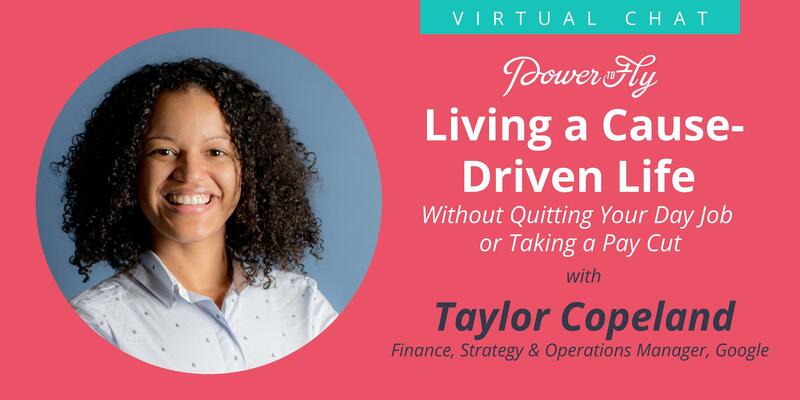 She's joining us for an hour of Q&A; to dive into how we can all live a cause-driven life without quitting our day jobs, or taking a pay cut - join us! How do you manage your time? What tools/ resources do you use? What inspired you to start your non-profit? How long did it take to get off the ground? How has your time at Google impacted the other areas of your life? Taylor currently works at Google in the Creative Lab as a Finance, Strategy and Operations Manager. Outside of work her and her husband own 2 real-estate companies and a non profit called Beyond the Basics Inc. Taylor is passionate about giving back to her community, enjoys traveling and is super excited to be a mom in July! This is a live Q&A with a subject matter expert - ask a question to spark a conversation!